Thanks to Donno for the link! Donno has been finding the good stuff lately and this is huge (in my opinion). 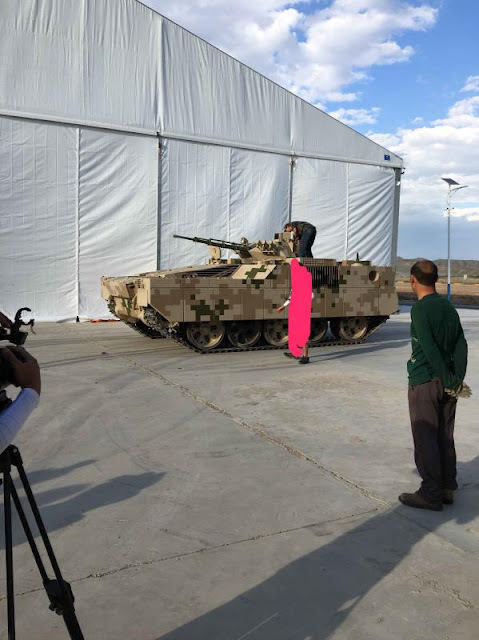 China has come up with a modification to their old Type 59 MBTs to turn them into a pretty credible looking and modern IFV. I can't get much detail from the pic but that appears to be larger than a 12.7mm in the turret and its difficult to make out more detail. One thing is apparent. The engine seems to have been moved. I can't tell if its to the front or side (guessing side by the exhaust) and they've built a raised troop compartment in back. Let me shout this from the rooftops. RUSSIA IS NOT THE THREAT! The EU can solve any issue they have with Russia by themselves. The country that is a threat to the existence of the United States is CHINA!!!! We should orient to face this threat on a mental, military and economic basis.